Atlanta city officials expected a million people from ranging from locals to out of town visitors to travel around downtown for the Super Bowl and related festivities. 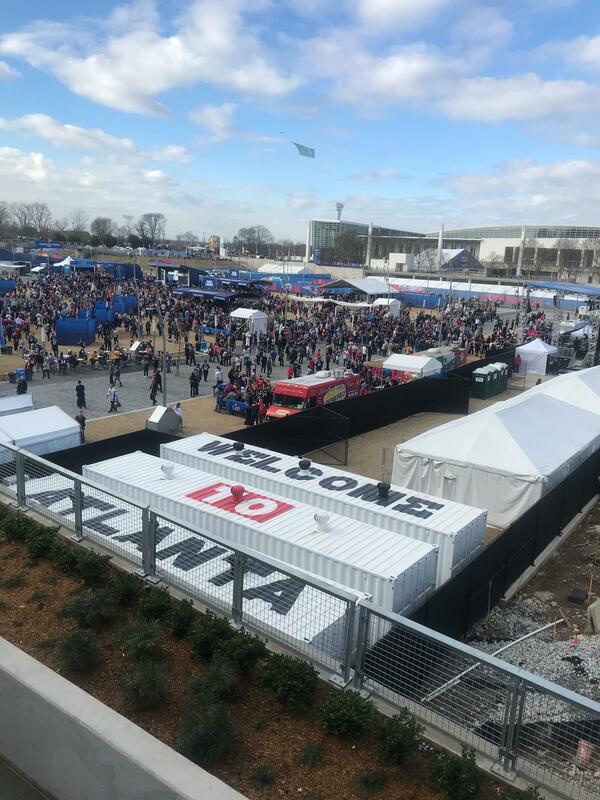 The fan experience in the Home Depot Backyard behind Mercedes-Benz Stadium on Super Bowl Sunday. Super Bowl Experience featured an NFL themed park in the Georgia World Congress Center, while music blared from dozens of free concerts in Centennial Olympic Park. Ruben Ramos, a fan of the New England Patriots, traveled here from Connecticut. “This is just great weather and the city’s beautiful,” Ramos said, sitting in the park sipping a beer. He went to Super Bowl 46 in Indianapolis, but the Patriots lost that game. Compared to last game, he said this was just a different atmosphere. He’s referencing Super Bowl 51; a sore spot for many Atlantans. The Falcons were playing in the championship game for the first time since 1999. They were up 28-3 in the third quarter. Thirty-one unanswered points and an extra quarter later, they walked off the field without the trophy. While that’s a memory Georgians try to bury, it isn’t the only connection to the state influencing which team people are rooting for. Both offenses feature stars from the University of Georgia. Todd Gurley is the top running back for the Los Angeles Rams, and Sony Michel has stepped up as a back for the New England Patriots in his rookie season. Cardell Smart of Ellenwood took in the Super Bowl experience with his family. They all sported UGA gear. Smart said he wants both Gurley and Michel to be successful, but, for Super Bowl 53, he’s going with the older Bulldog. Juilan Smart is Cardell’s 9-year-old son. He sided with his dad’s choice in team but for a different reason. “I’m going with the Rams because I don’t like Tom Brady and how he agrees with Donald Trump,” he said. On multiple occasions, President Donald Trump has publicly praised the Patriots quarterback and has called him a friend. During Trump’s run for office, a “Make America Great Again” hat was spotted in Brady’s locker. Brady and Trump’s relationship wasn’t the only intersection of sports and politics. At Piedmont Park in midtown, hundreds of people gathered for an anti-Confederate monument rally. 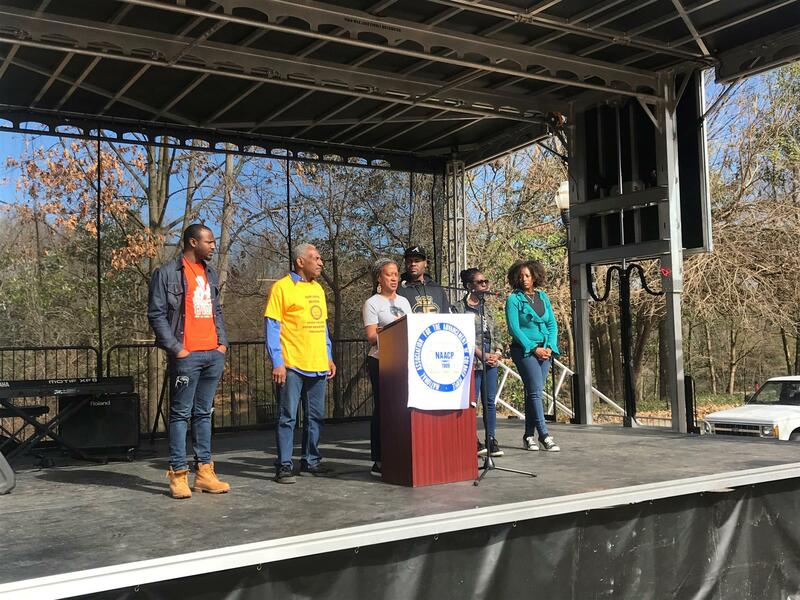 Richard Rose, president of Atlanta's NAACP chapter, is joined on stage by local social justice organizations. Richard Rose, president of Atlanta’s NAACP branch, said while the Super Bowl is a world-wide event, the conversation on social injustice must continue long after. “This is about life. Sports are just a part of life,” Rose said. “The world is here in Atlanta, looking at Atlanta. We want to take this opportunity to talk about what Georgia really is. Georgia is home to the largest shrine to white supremacy." Rose was referring to Stone Mountain, which has three Confederate generals carved into its side. The park was closed Saturday, due to the threat of a white supremacy rally that never received a permit. Instead, members of Atlanta antifascists held a “victory” rally where they burned a Klansman effigy. Politics aside, there was still a game to be played. And that’s what brought throngs of people downtown including Jerome Harper. He and his wife live here but wore their Philadelphia Eagles gear proudly. He said this weekend helped erase some of the bad memories from the last time the Super Bowl was played here. Back in 2000, Atlanta was hit with two ice storms the weekend of the game. The night after the game, two men were stabbed to death by the group of Hall of Fame Linebacker Ray Lewis. Harper said he has one thing to say to the Falcons owner whose goal in building Mercedes-Benz Stadium was to attract major sporting events. Super Bowl 54 will be in Miami. A game that Blank and most of Atlanta hopes the Falcons will be playing in. Though, the sporting events don’t stop coming into town. Next year, Mercedes-Benz Stadium will host the NCAA Final Four. Then in 2026, as North America hosts the World Cup, FIFA has announced games will also be played here.